Hydro-Gear has more than 9,000 authorized service centers globally. Our trained professionals can service or repair your Hydro-Gear product with original high-quality factory parts. Phone: 1-877-728-7410 (toll free in U.S.) or use our Dealer Locator. Download Service and Repair Manuals here. 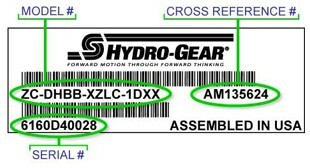 All Hydro-Gear® products can be identified by the label attached to the product depicting the model and serial number. You will need this information when asking for specific assistance with service and/or repair needs. This list will help you identify what the product name is for your particular product based on the prefix on your product label.